Julian Jackson Sr. and Clayton Laurent Jr. announce Laurent’s new management contract. Calling himself “Mr. 340,” nine-year amateur fighter Clayton Laurent Jr. announced Friday that he will soon make his professional debut on St. Thomas, in a fight tentatively scheduled for Aug. 19. 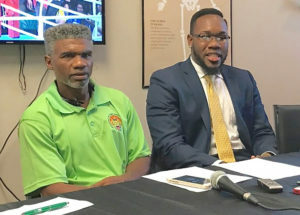 During a news conference Friday on St. Thomas, the 26-year-old Laurent said he had signed a management contract with Matt Clark of Exite Fight Promotions and Philippe Fondu of World Sport Promotions and is backed by sponsorships from FirstBank and St. Thomas-based Rock City Wellness, whose team will work to keep Laurent in top shape before and after his fight. “I’m nervous, I’m like a kid here today,” Laurent joked at the press conference. The 225-pound heavyweight puncher said that turning pro “absolutely the right decision,” made at the right time. 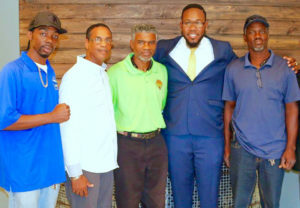 Backed by his father, three-time world champion boxer Julian “The Hawk” Jackson, and longtime trainers David Rogers Sr. and Susthens “Joey” Vialet, Laurent said he had contemplated turning pro years ago after he won the bronze medal in the qualifier for the 2012 London Olympics. At the time only the silver and gold medalist advanced to the Olympics, Jackson explained. So, the team bided its time and saw Laurent through the 2016 Rio Olympic Games, where he caught the eye of Clark and Fondu. From left, Julian Jackson Jr., Susthens ‘Joey’ Vialet, Julian Jackson Sr., Clayton Laurent Jr., and David Rogers Sr. Speaking over the phone Friday from Australia, Clark said Laurent’s performance in the Olympic ring against Eric Pfeifer, the top contender from Germany in the 2016 preliminaries, made him and business partner Fondu look twice at the young V.I. boxer. “He’s a kid that has got plenty of potential,” Clark said. Fondu, an international matchmaker from Belgium, currently manages the World Boxing Association’s World bantamweight champion, Zhanat Zhakiyanov (27-1-0) out of Kazakhstan, while Clarke took Australia’s Lucas Browne (24-0) to a heavyweight championship in Chechnya. Clarke said that he and Fondu have put feelers out for potential opponents to come and fight Laurent in August and will make an announcement closer to the fight date. In the meantime, trainers Rogers and Vialet added, Laurent has shown his ability to do what it takes to come out on top. While Rogers said Laurent’s training team will work on different things, he is confident in his fighter’s work ethic. Laurent’s skill is in his hands, Rogers said, and he’s ready to work hard enough to improve the rest. Jackson added that Laurent’s speed is also matched by his stamina. “There are people that expected him to run out of gas many times, but for him the third round is almost like the first,” Jackson said. Laurent is backed by sponsors FirstBank and Rock City Wellness, whose teams will be covering Laurent’s fitness regimen, gear, and community outreach efforts, among other things. The Jackson family is such a positive force on this island. They are in total service to the people around them. I commend them on their latest endeavor to mentor this young man, and on their continuing mentorship of so many of our island’s youth. Thank you to the Jacksons!